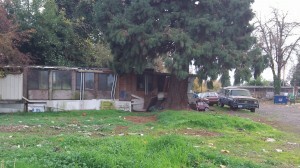 One of the trailers remaining at Woodland Square on Nov. 8. Big news for an Albany neighborhood: Woodland Square, an urban renewal project supported by CARA, has won state approval of the tax credits it needed to go ahead. The project will replace the trailer park at Salem Avenue and Pine Street with a 54-unit apartment complex. Construction is expected to start in June 2014, the city administration says in a press release. CARA, the Central Albany Revitalization Area, has committed $1.45 million toward the $10.6 million project being planned by Innovative Housing Inc. of Portland. 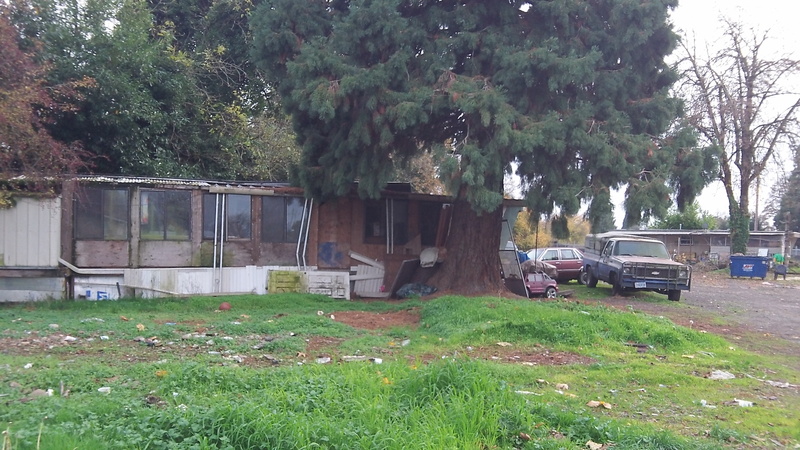 As part of that commitment, CARA last year advanced the company $817,660 so it could buy the 2.1-acre site, relocate 14 households living there and demolish 17 trailers. Only six trailers remain, and environmental cleanup has been completed on part of the site that once had a gas station. Urban renewal manager Kate Porsche said Innovative Housing helped residents find places to live. One of them, a veteran, moved from one of the trailers to a home of his own, she said. IHI needed the state tax credits to finance the project. It lost out last year but was successful when it applied again this year. The trailer park had been a neighborhood worry for years, and CARA is helping the project as part of its mission to repair urban blight. IHI has described the planned apartments as “workforce housing” with rents starting at about $450 for a one-bedroom unit. Tom LePage, on Facebook: This is a MUCH better project than that stupid sidewalk downtown. The jury is still out on the whole CARA thing, but at least this project will benefit the community in a tangible way. Jim Engel: Please tell me why replacing it with a bunch of “work-force” priced rental apartments is going to improve the area? You’re going from a few ratty, shabby trailers to how many apartments for subsidized persons? In Detroit, N.Y., Chicago they are called “the projects” and are some of the most crime ridden areas in those cities. In Albany we already have Colonial Court on 34th or Hill House at 19th & Hill. What would be wrong with stand alone houses for single families on the site? The present idea is concentrating poverty once again as I see it & had dealt with it for 29 years on patrol. I don’t think our H.H. host or any member of our council would want this project in their neighborhood! IHI is a 501(c)(3) nonprofit who is exempt from paying local property taxes. The previous owner of the property was a private citizen who paid the property tax. Taking property off of the tax roll decreases the value of the city’s tax base. Is the tax revenue benefit of this project a negative number? And CARA “invested” $1,450,000 of our property taxes, money that was siphoned away from the other taxing districts like the sheriff and the jail. What is the public’s return on this investment? Zero?